Maybe I’m just fed up with the winter. Or maybe I’m thinking that a year ago I was walking my youngest daughter down the aisle in Turks & Caicos, enjoying the turquoise Caribbean Sea and the amazing fresh, spicy and citrus spiked cuisine. The recipe included here is from Cooking Light. The prep called for cooking the pork chops in a skillet, I decided to dig my Weber out of the snow and cook the chops on the grill… more in keeping with the great dishes served in Turks. My mint patch is under a thick blanket of snow, so I had to use the fresh spice display of Stop & Shop. Rosé in the winter? Well… yes! We have seen the popularity or Rosé during the warm weather months take-off; but truth be told the wine is enjoyed year ‘round. Check out the famous ski resorts of Europe… the après-ski festivities by the log fire or in the hot tub, bottles of refreshing chilled Rosés flow like water! 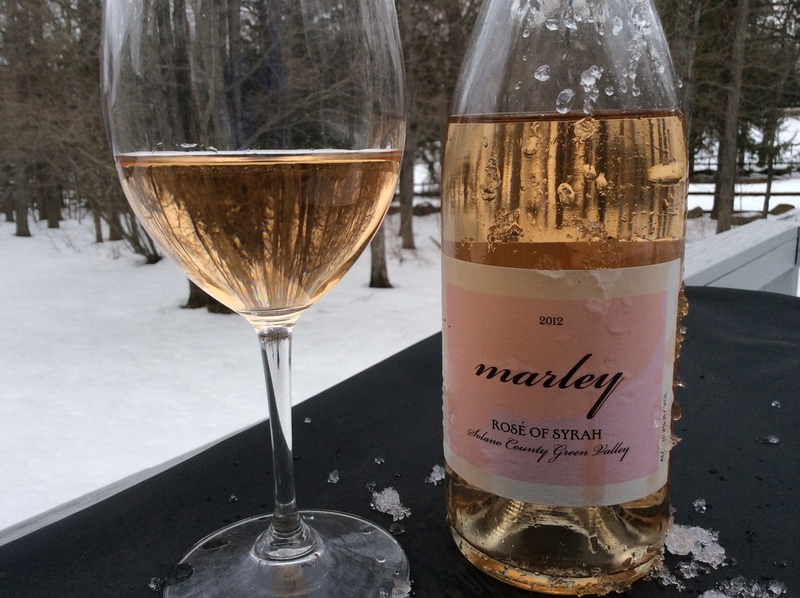 And with the spicy pork chops on the menu tonight, Marley Rosé is the perfect call. This stunning Rosé is 100% Syrah from Solano County’s Green Valley. Its soft salmon color is inspired by the golden pale Rosés of France’s Provence region. Made in the classic saignée method to retain the freshness of flavor. This pleasingly dry wine exhibits lush flavors of orange peel, soft and supple on the palate and is best enjoyed chilled. From first sight to last sip this wine is a refreshing escape to Provence or Zermatt (or to the sunny Caribbean)! Combine first 3 ingredients in a small bowl; sprinkle evenly over pork. Heat a large nonstick skillet over medium-high heat. Coat pan with cooking spray. Add pork; cook 4 minutes on each side or until done. Combine mango, mint, lemon rind, lemon juice, sugar, and red pepper in a medium bowl. Serve with pork. n.b. I patted the pork chop dry, doubled the rub ingredients and put the chops in one of those freezer bags and shook the hell out of it ‘til the chops had a good coating. As noted in my intro, I put the chops on the grill. 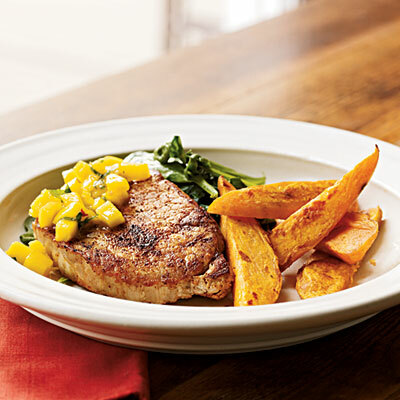 Sweet potatoes are the perfect side, a green veggie and you’re set to go!